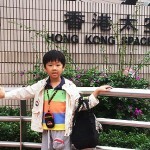 Pangzi at Dream Come True, the so-called Hong Kong KidZania. 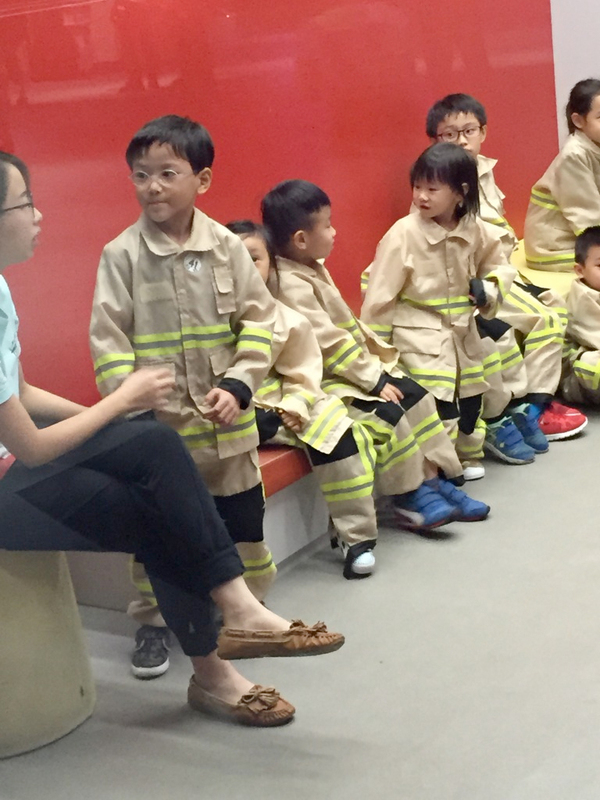 There’s no Hong Kong KidZania, but an equivalent called Dream Come True lets kids pretend to be adults in their dream professions. 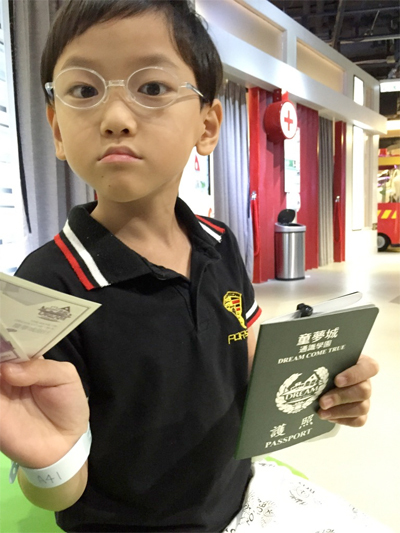 I heard the guides at this Hong Kong KidZania could only use Cantonese, which was going to be a problem for Pangzi. How then would he enjoy? 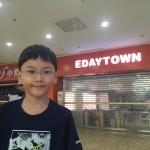 “Let me teach you something in Cantonese. 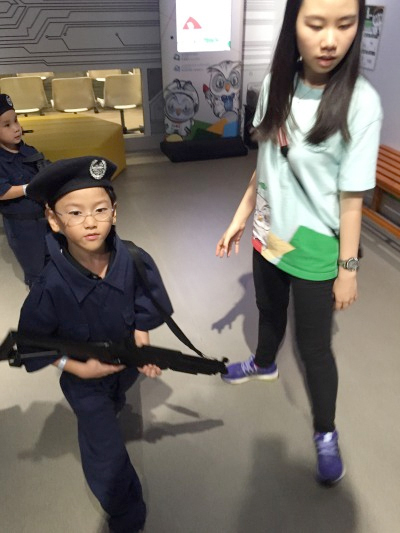 When the aunties are ignoring you, you shout: I am harm sub!” I told Pangzi. “Daddy, what is harm sub?” he asked. 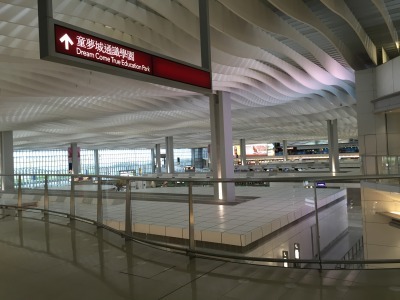 Armed with this killer phrase, Pangzi was on his way to this indoor park situated at T2 of the Hong Kong International Airport, of all places. 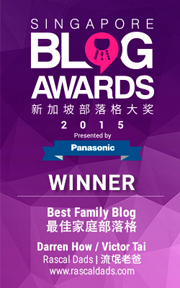 Well, the location makes sense for a Hong Kong KidZania -like venue. You need to house a fire station, police station, space station, hospital, aircraft cockpit, modelling runway, broadcast studio and more. 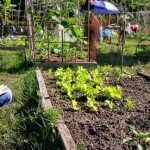 Where else in this land-scarce city do you get that space? Dream Come True is very organised in terms of queuing for the stations. In fact, there’s NO physical queuing. 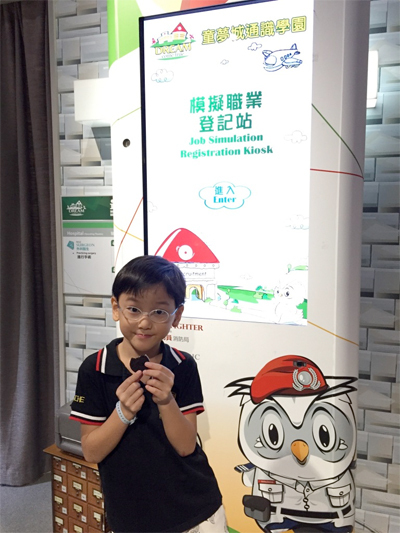 A full-height kiosk at each station gets you to scan your fake passport to register your kids for the role-playing activities. Each am or pm session packs in six time slots, all digitally managed and captured in bar codes. You just have to appear when it’s your turn. For such high-tech facilities, you’d be expected to pay top dollar. 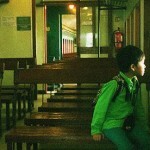 Tickets cost HK$320 for a kid up to 16 years old, and HK$160 for an overgrown kid, i.e. adult. If you earn enough of the kiddy currency at the stations, you can exchange it for snacks. 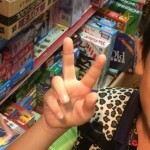 I don’t remember paying this much for the one we went in KL. 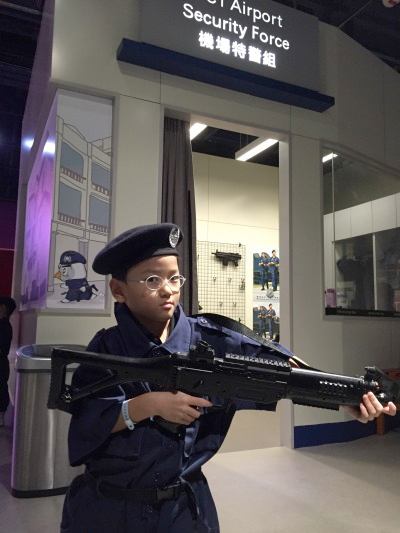 This Hong Kong KidZania clone had better be good. With great hope comes greater disappointment. We arrived late, and missed the first two sessions. 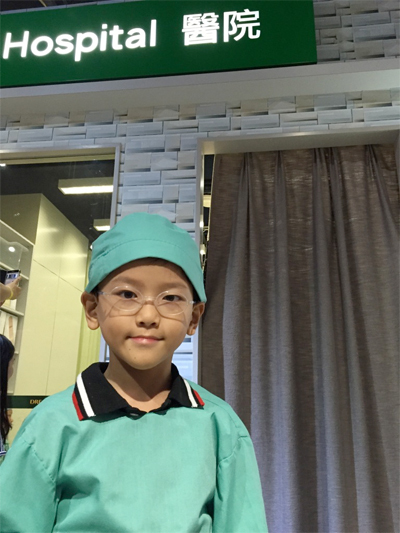 The guides hastily helped dress Pangzi up as an assistant surgeon at the make-believe hospital. They had yet to realise he could only speak English. 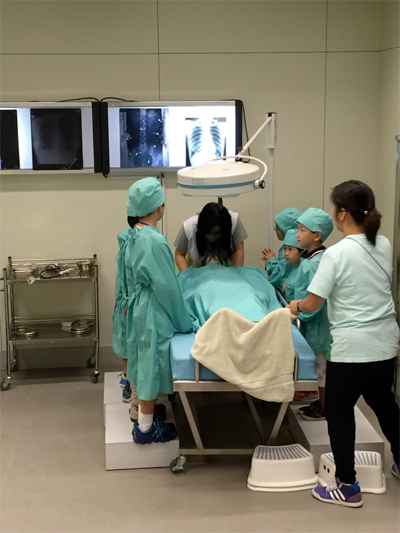 Then Pangzi joined other kids at the operating theatre, where the doctor had already started explaining how to cut up bodies… in quickfire Cantonese. “Excuse me, I am very harm sub!” Pangzi declared. The doctor dropped her scalpel. After recovering from the initial shock, she found out what was going on and instructed one of the guides to translate for him. The guide duly obliged, but throughout the session she was adjusting her clothes in fear. The kids in uniform were given some time to pose for pictures with their parents. 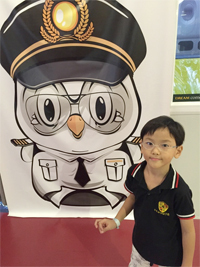 “Daddy, harm sub or not?” Pangzi proudly said. The next station was for little firemen. 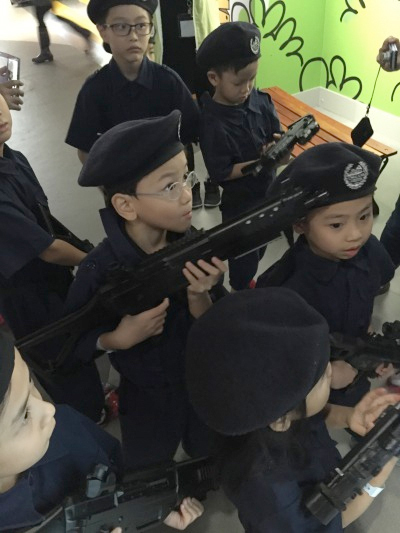 The kids changed into gear and attended a briefing on how to operate those giant peeing machines. Again, Pangzi couldn’t understand a word. Then the little girl beside him giggled and whispered in his ear. Wait a minute, did I see him wrap his arms around her? After the briefing, the kids came out for photo-taking in front of the static fire engine. Yes, static. What a scam. 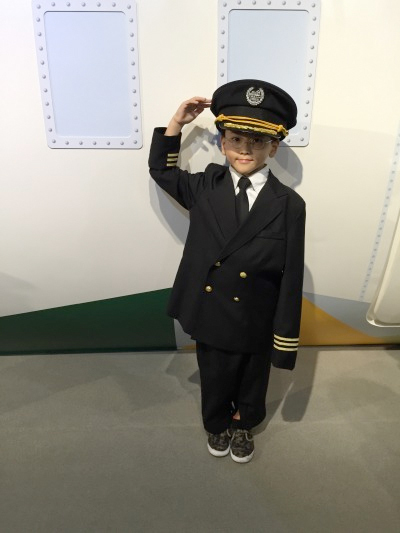 In KidZania, vehicles move! 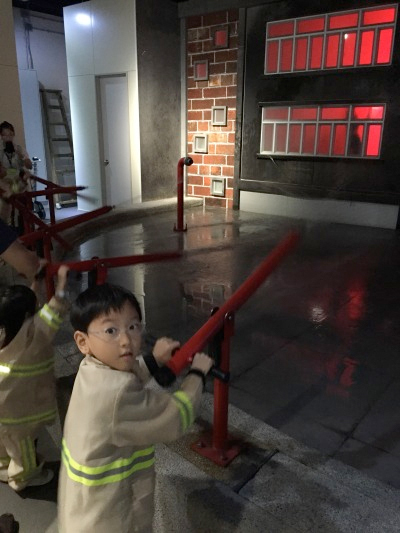 To put their training to good use, the kids went on to put out imaginary fires with the giant peeing machines. 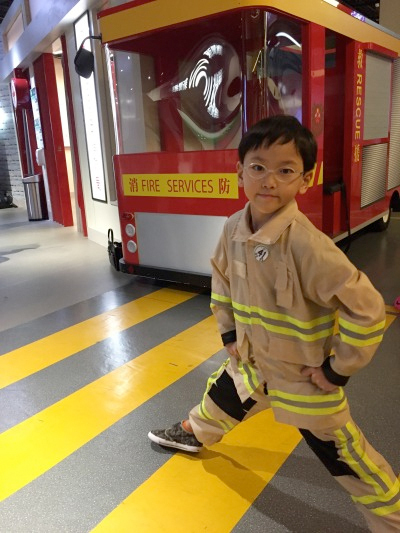 Pangzi was all suave in his fireman costume. 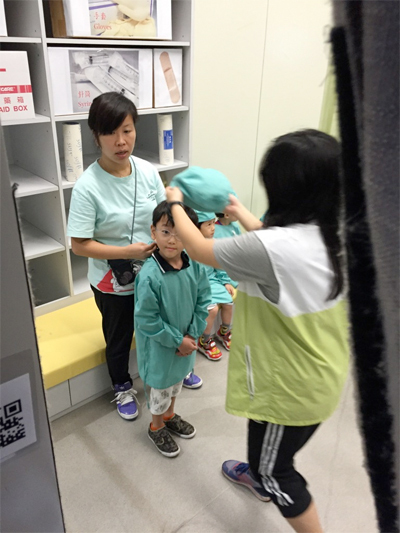 I thought I could hear murmurs among the other parents watching. Next was the police station. 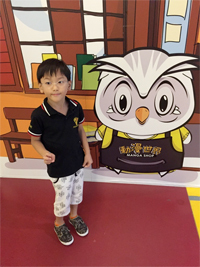 By now word had got around the guides about a certain boy from Singapore who needed translation. They assigned a young lady to him. A huge, huge mistake. Notice the elaborate costume, complete with beret and weapon. That’s the saving grace. Dream Come True isn’t very large, and the cosplay somewhat makes up for it. 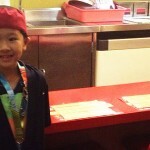 Until the Singapore one is ready, this Hong Kong KidZania will do. 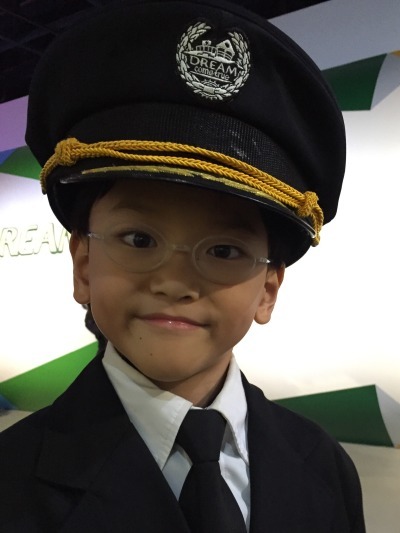 Lastly, Pangzi became a pilot and got to don the most stunning outfit of the day. Don’t you think he’s indeed very harm sub?